1) Select a symmetrical watermelon. If necessary, cut a thin slice from the bottom of the watermelon so it sits level. 2) Draw a straight line (just above the middle) lengthwise around the watermelon for the baskets edge. 3) Draw a handle diagonally across the top as shown in the photograph. 4) Draw a bow as shown on the photograph so that one edge of the bow is connected to the baskets edge. 5) Cut and remove the top sections leaving the handle and the bow intact. 6) Scoop out the flesh from inside the watermelon with a melon baller leaving a trace of red on the inside of the watermelon. Drain the watermelon before filling. Slice the melons in half, and scoop out seeds. With a melon baller, scoop out flesh from cantaloupes and honeydews (or other melon types, if using). In a large bowl, combine sugar, lime juice, lemon juice, vanilla extract, orange liqueur (optional) and lime zest. Stir well. Add all melon balls (including the watermelon balls), strawberries and grapes and toss to combine. Allow fruit to chill in refrigerator for 30 minutes. 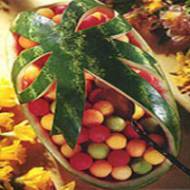 Just before serving, transfer fruit salad to watermelon basket. Serve the watermelon fruit salad in dessert cups or glass goblets as a refreshing and colorful summer dessert, or as a special dish for a mid-day brunch or an afternoon or early evening barbeque. Top each serving with a scoop of whipped cream, or ice cream, and garnish each with a mint sprig. It is important to purchase watermelons that are fully ripe, since they don't continue to ripen once they have been picked. A ripe melon feels heavy for its size and has a sweet, fresh fragrance. My boy friend absolutely loved it!!!! Its very colorful and its great for summer. It makes a good impression for guests.